Our mouths can be filled with food, profanities, or gossip. Or... we can choose for our mouths to be filled with praise for God and his loving grace. We can talk about many things and speak to many different people about many different subjects. 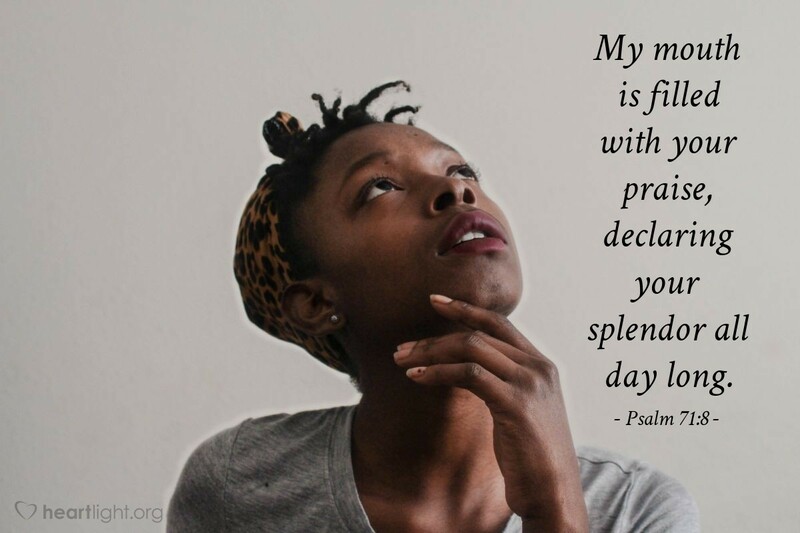 Or... we can choose to declare the greatness, majesty, and splendor of our heavenly Father all during our day. Why don't we choose to praise God with our mouths and tell him of his greatness and let others know of his grace as we go about today's activities? Holy and marvelous Father, you are God of all creation and also God of all grace. Thank you for your kindness shared with me in Jesus. Thank you for your powerful victory over death when you raised him from the dead. Thank you for your patience with me as I sometimes stumble, but am always desiring to more perfectly reflect the character of Jesus. Please help me, O Lord, to profess and to show my love and admiration for you all during this day. In Jesus' name I pray. Amen.